So if I can run a marathon weighing in at over 16 stone with less than a couple of months training I figure that other overweight girls could too. The Fattymustrun Marathon Challenge – 16 overweight ladies from around the world were recruited in May 2013 to work with me for 10 months in preparation for a spring marathon. Each month they are set a series of challenges and they support each other via a closed facebook page. Look out for the recruitment phase for 2014 – Could you run a marathon in 2015? Fattys10Kchallenge – A 10 week training plan based on my eBook 10K to prepare you for a 10k in only 10 weeks. 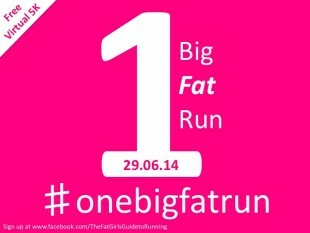 New cohorts of runners are recruited every few months and progress of the participants is reported on the Fat Girls Guide to Running Facebook Page so why not get involved. Wherever you are in the world, get your running shoes on and be part of the fattymustrun revolution. So what are you waiting for people? Get involved! !